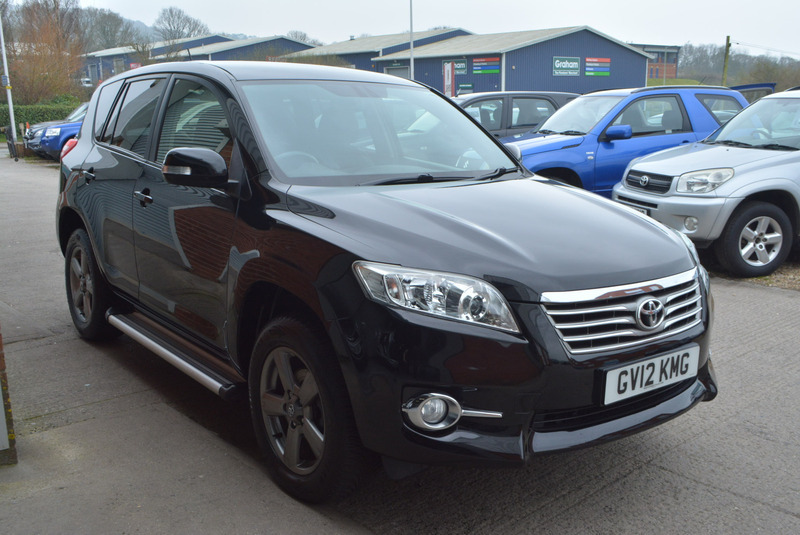 4 WHEEL DRIVE*SATNAV*REVERSING CAMERA*TOTAL TOYOTA SERVICE HISTORY*THE BEST AVAILABLE! THIS GENUINE LOW MILEAGE TOP SPECIFICATION TOTAL TOYOTA MAIN DEALER SERVICE HISTORY EXAMPLE IS THE BEST OF ITS KIND AVAILABLE TO BUY IN THE UK TODAY! AN OUTSTANDING LOOKING MACHINE THROUGHOUT AND A REAL CREDIT TO ITS PREVIOUS OWNER! SALES PACKAGE TO INCLUDE 1 YEAR WARRANTY, 1 YEAR MOT WITH NO ADVISORIES, TOYOTA MAIN DEALER SERVICE AND HEALTH CHECK AND FREE DELIVERY POSSIBLE WITHIN THE UK! IF THIS IS NOT ENOUGH FOR YOU TO COME AND BUY THIS VEHICLE, THEN READ ON! 7 MAIN DEALER SERVICE STAMPS WITH INTERVALS @ 8K, 10K, 12K, 14K, 22K, 32K & JUST SERVICED! FINISHED IN THE BEST COLOUR COMBINATION OF ASTRAL BLACK METALLIC WITH BLACK LEATHER AND SUEDE INTERIOR, COLOUR SCREEN SATELLITE NAVIGATION WITH REVERSING CAMERA, MEDIA PACK, FULLY BLUETOOTH ENABLED AND USB/AUX INPUT DOCKING, SUPERB CONDITION FACTORY FITTED GRAPHITE GREY 18" ALLOY WHEELS WRAPPED IN GOODYEAR PREMIUM TYRES ALL ROUND! FULLY ELECTRIC HEATED DRIVER AND PASSENGER SEATS, TWIN ELECTRIC TOWING EQUIPMENT INSTALLED, REAL PARKING GUIDANCE SYSTEM, LATERAL SIDE IMPACT PROTECTION STEPS, UV PROTECTION PRIVACY GLASS IDEAL FOR CHILDREN! 2 FULLY REMOTE LOCKING SMARTS PRESENT ALONG WITH ORIGINAL LITERATURE PACK IN LEATHER CASING, KEYLESS GO AS WELL AS KEYLESS ENTRY, CRUISE CONTROL, DOWNHILL DESCENT OPTION WITH DIFFERENTIAL LOCK! A TRUE FULL HOUSE VEHICLE IN EVERY WAY POSSIBLE. I CANNOT STATE ENOUGH THAT THIS IS BEST OF ITS KIND LEFT IN CAPTIVITY SO DONT DELAY AND CALL TO RESERVE TODAY!